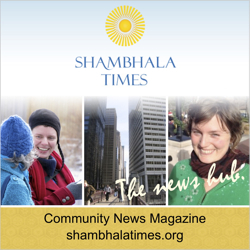 The Boulder Shambhala Center is hosting several upcoming community conversations. These gatherings can help us all understand the significant breadth of perspectives and feelings in our community. Changes are necessary, and communicating with each other will help us identify what changes are most helpful now. Gatherings of 4 to 8 participants per group will be held on Wednesday, April 3rd at 7pm and Sunday, April 14th at 1pm. There is no particular topic—bring whatever is in your heart right now. If you are in this group and have not received an invitation, contact [email protected]. There are two options: Thursday, April 11th from 6:30–8pm and Saturday, April 13th, 10–11:30am. Holly Gayley, Judith Simmer-Brown and Rose Sposito will host this group on Thursday, April 25th at 7pm. This will be a time for exploring samaya, guru principle and related issues in light of the Sakyong’s recent letter. An invitation to tantrikas with more information is forthcoming. This group is restricted to tantrikas. On May 16th at 7pm, the Interim Board will present on various topics of interest and then take our questions. These topic-driven events are being planned for June through November. We are developing approaches for assigning topics and facilitators and how to link these to the Kindness Circle conversations. More to come.